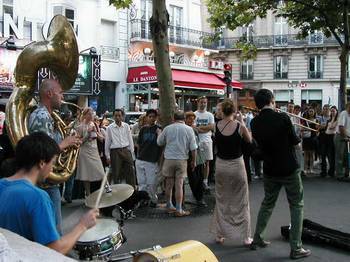 We took the number 12 metro from Montmartre to the St. Germain des Pres area. 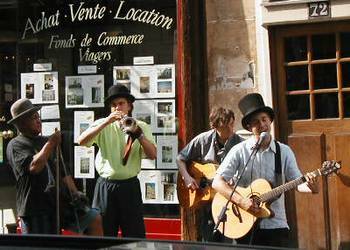 Here we found the street musicians that were absent from Montmartre. 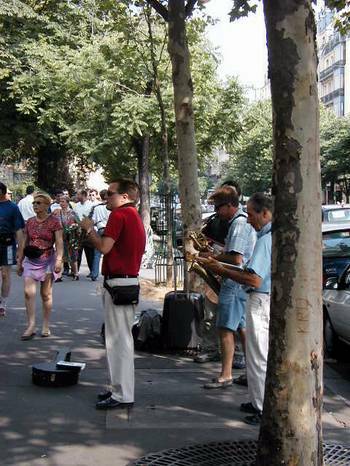 This group was French, playing good Dixie land jazz. 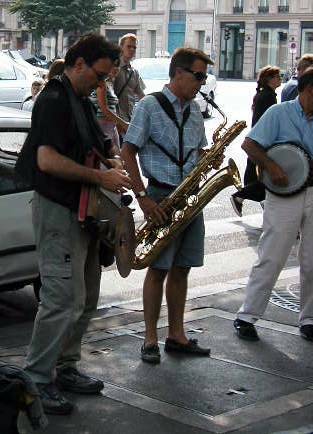 The percussionist, playing an elaborate washboard, is someone we've seen before, performing with other musicians. He's lost a bit of weight since last year. This group consisted of Americans, playing some authentically funky stuff. The older man and I made eye contact and had a funny exchange of facial expressions during one of his funnier songs. 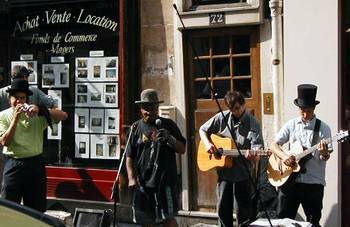 The young singer (in top hat) seemed to be of college student age. Our guess is that he's taking lessons from one of the older ones. He was the only one to read the music from charts. This group was French. 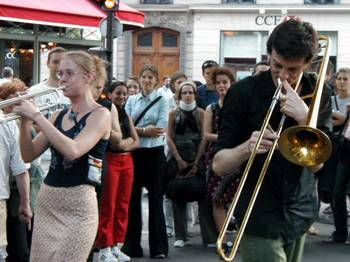 The woman on the trumpet was a stitch -- very young, hopping and dancing all over the place. Their music was hip, modern jazz. Many of the beats they used were Latin, but fast. We stood by a statue behind the band for a while so Tom could watch the drummer's hands & feet. Citroen has come out with a new car called the Pluriel. It is a big hit here now. Here's a row of them. 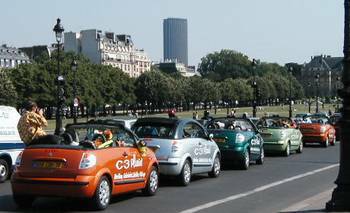 The car can be converted from a coupe to a cabriolet to a spider/roadster to a small pick-up. This one is for Mona Lisa fans in Columbus, Ohio. 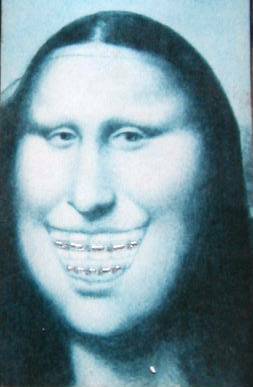 An orthodontist's take on Mona, from a Montmartre window. By the way, the New York Times, the International Herald Tribune, and Le Monde all misspelled Columbus when the story broke about the terrorist truck driver arrested there. Never mind that Columbus is the capital of a very populous and important state. Never mind that the three U.S. cities named Columbus are ALL spelled Columbus. Never mind that Columbus is the most populous municipality in Ohio. Never mind that these are supposed to be good, accurate newspapers. Never mind that Columbus is not in a South American country and is therefore NOT spelled "Colombus." To see this error once or twice would have been amusing. But to see it repeated in several papers was outrageous. Eventually, the newspapers got the spelling right. 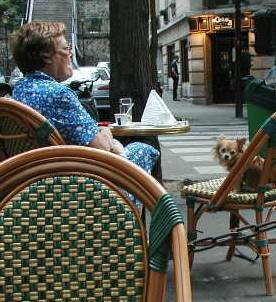 Before heading to the metro, we relaxed at a cafe. This nice couple was in front of us. 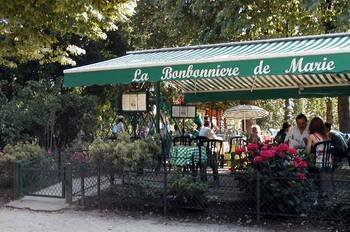 This pleasant outdoor cafe we discovered in the Champs de Mars, right next to a children's playground. So, mom and dad can have a glass of wine while watching the kids play. Great idea. This city is SO civilized . . . .